Rural villages in Bhutan are seeing vast improvement in living conditions through the Rural Economy Advancement Programme (REAP), supported by the Government of India. 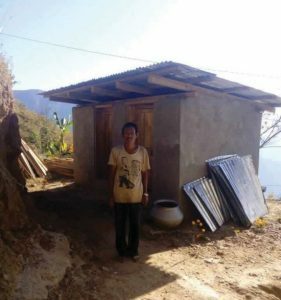 The two stories below from the southern districts of Samtse and Sarpang are illustrative of how the programme is benefitting people at the grassroots, through the provision of basic sanitation and housing facilities. Khempa is a small village of 34 registered households and 186 residents, located in Samtse Dzongkhag. Up until recently, the practice of open defection was the norm and community members did not fully see the need for proper toilets, even as many inconveniences abounded especially for its 91 female residents. Besides contributing to the villagers’ frequent experience of chronic diarrhea, intestinal worms, bilharzias, hepatitis, and other such diseases, the lack of proper toilets posed additional issues for women and girls in particular. They silently tolerated the embarrassment of open defecation, waiting until before dawn or after dark to relieve themselves. In the process they ended up either holding it in or drinking less water over the course of the day, often leading to urinary tract infections as well as dehydration. As the residents had poor understanding of the need for proper toilets and sanitation, making changes to their habits was difficult especially as they didn’t want to invest in the construction of toilets. A change in mindset finally occurred after long periods of awareness raising and sensitization, following which the actual construction of the toilets and the residents’ use of them was a much easier process. As in Khempa village, toilet construction under the REAP II project is changing the sanitation scenario in many other rural communities. With the collective efforts of the villagers, the project has been able to achieve 100 percent toilet construction in several of these target villages. (Based on the reporting of Suk Bdr. Rai, Assistant Field Officer, Samtse). Tajugang (Bhakgjungay) is a very remote and small village with only six households, located in Jigmecholing Gewog under Sarpang Dzongkhag. With the recent farm road reaching its neighboring gewog Chhudzom, Tajugang is a five-hour drive and four-hour walk from the centre. Harka Badhur, who is from this village and now 23 years old, had until recently lived in a one-storied mud-rammed house with his parents, elder brother and sister in-law with their three children. Their house had only two rooms—a kitchen and another room where the whole family slept. Harka recalls how he would mostly sleep at his friend’s place just to create space for the rest of the expanding family. While not having enough space was a problem on the one hand, not being able to afford better housing caused much distress. Their thatch roof could not withstand the heavy monsoon rains every year, leaving them drenched and exposed to the elements. “It was then that the Tarayana Foundation under REAP II project changed not just my life, but my family’s as well by gifting us a house which was actually beyond our means to even think of constructing. We no longer worry about spaces and the heavy monsoon rains do not bother us as we now have CGI roofing”, says Harka. He added that his family also received materials for the construction of a flush toilet and bathroom, and that they enjoy better health as open defecation is a thing of the past. There is a visible change in Harka who was previously very quiet and is today brimming with confidence. Here is a man who earlier could not think of marrying because of his living conditions; but all that changed when Tarayana Foundation’s Housing Improvement Programme under REAP II enabled him to work hard and take up the opportunity to improve his condition. The lives of Harka and his family members have clearly been transformed, and hundreds of families like Harka’s have benefitted from the Programme. As of today, eight of the eleven houses approved under REAP II have been completed and the balance three are in various stages of completion. (Based on the reporting of Karma Wangchuk, Programme Officer, Sarpang).